This cover shot of the December 2013 issue of Car and Driver proclaiming that they are leaking the 2015 Ford Mustang hit the web sometime this past weekend amidst quite a bit of speculation. Viewers of the cover image depicting the 2015 Mustang questioned whether this was an actual issue of Car and Driver or just a skillful piece of artwork created by some talented and mischievous photoshop artist who wanted to stir up the automotive rumor mill. If this is indeed a photoshop of a magazine cover, it is a very (very, very) good one and with all of the buzz created by this cover image, you would think that the folks at Car and Driver would have something to say if it was fake…and if they weren’t involved. There was also the question of whether or not the car shown on the cover was actually an image of the 2015 Ford Mustang or if this was just another very high quality rendering similar to the computer generated imagery we have been discussing here on TorqueNews for months now. 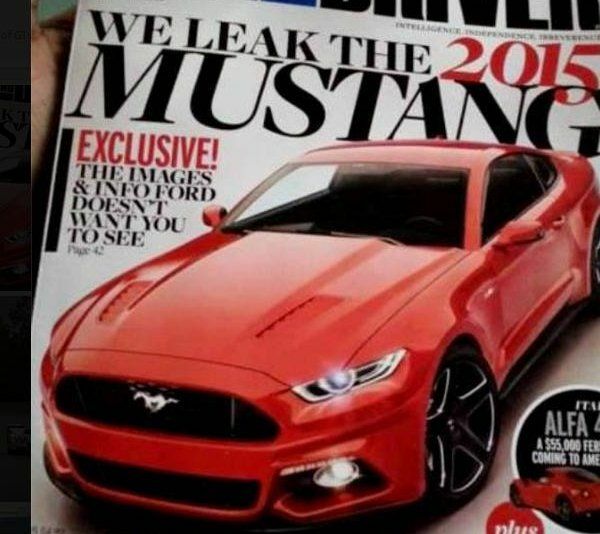 The wording on the magazine cover would lead us to believe that this is indeed an official image of the 2015 Mustang – especially when you consider all of the “leak” talk – but a post on the Car and Driver Facebook page makes me think twice. This Facebook post refers to one of their leaked images as “almost definitely” the 2015 Ford Mustang and that causes some question about whether the image on the cover of the December C&D is really a picture of the 2015 Mustang or if it is just very high quality artwork. Whether or not this is really a picture of the December 2013 Car and Driver magazine cover and whether or not this cover really shows an actual image of the 2015 Ford Mustang aside – this picture certainly gives us the best look yet at the next generation Mustang. There are no real surprises thanks to the many enthusiast-generated renderings (provided that they are all accurate and my sources have indicated that they are) but this is the “realest” and most polished looking shot we have seen thus far of the 2015 Mustang. As expected, the 2015 Ford Mustang wears the face of the Evos design language that has stirred quite a bit of controversy over the past few months but the rest of the body looks to be very similar to the shape of the current Mustang. The roofline looks like it might be a bit lower than the outgoing model and the C pillar looks like it might extend a bit further towards the rear of the car - stopping just shy of the full fastback look – but all in all the front end of the new Mustang is by far the most drastic physical change of the 2015 model. It is hard to tell from the images but based on the hood, we would guess that this is the GT model - or the Mach 1, as the case may be. While the new front end of the 2015 Ford Mustang is somewhat similar to that seen on the current Ford Fusion and that has caused some controversy, I find the new look to be a solid evolutionary change. The current look has been around since the 2005 model year and while sales have stayed fairly strong, the time has come for a change and the implementation of the Evos design language gives the 2015 Mustang a very modern look that is likely to resonate well in the global market. Also, while there are some negative opinions about the new look thus far, I should point out that when the current generation Mustang was introduced for the 2005 model year there was a great deal of negative feedback about that design. Even though sales were strong right away, many long time Mustang fans and owners were quick to complain so the early complaints over the exterior design of the 2015 Mustang are both to be expected while also being likely to fade over time. So provided that this magazine cover really does show the 2015 Ford Mustang – what do you think of the new design? Tell us in the comment section below! Amazingly, Stunningly DISAPPOINTING....TOTALLY UNREMARKABLE.... TOTALLY AVERAGE....TOTALLY FORGETABLE. Totally Lame.. It looks virtually UNCHANGED from previous years.. What a TOTAL waste of time and energy..What a total waste of an opportunity to do something interesting. This design is an Utter YAWN-FEST. Utterly BORING...merely a refresh..and a minimal one at that.